The Carter Center released notice that the former president would be traveling to Israel, West Bank, Egypt, Syria, Saudi Arabia, and Jordan—umbrella-ed under a “study mission” to support peace, democracy, and human rights in the region. In a recent interview with ABC News, the 39th president admitted that although he is going neither as mediator nor negotiator, his relentless commitment to peaceful resolve in the area has prompted the move. “It’s very important that at least someone meet with Hamas leaders to express their views, to ascertain what flexibility they have, to try to induce them to stop all attacks against innocent civilians in Israel and to cooperate with the Fatah as a group that unites Palestinians, maybe to get them to agree to a cease-fire—things of this kind.” Carter will be the first prominent American figure to meet with Hamas leadership since 2006 when US veteran civil rights leader Rev. Jesse Jackson met with Khaled Mashaal in Syria. Opening dialogue with the group formerly known as the Islamic Resistance Movement is nothing new for Carter. Shortly after the January 2006 elections “they told me that they were willing to declare, along with Israel, a complete ceasefire in Gaza and in the West Bank, that they were fully endorsing the right and authority of Amhmoud Abbas, the Fatah leader, to negotiate on behalf of all the Palestinians,” said Carter. Although by June of last year, after ousting all of the Fatah faction, Hamas seized the Gaza Strip by force. The Bush administration and the Israeli government strongly oppose Hamas. National Security Council spokesman Gordon Johndroe responds, “Former President Carter is a private citizen. The US Government policy is unchanged: Hamas is a terrorist organization. The meeting between Carter and Hamas leader Khaled Mashaal took place in Damascus. The Associated Press reported that Carter sent an envoy to Damascus requesting the meeting with Islamic group officials, including Mashaal, and that they “welcomed the request.” Mashaal is head of the Hamas political bureau and believed to be top leader. In 1997 Israeli agents sprayed him with poison on a street in Amman. It is said he fears an (Israeli) assassination. Israeli politician and Shas chairman Eliyahu “Eli” Yishai was part of Carter’s agenda earlier in the week, with intention to send messages to Hamas through Carter for the release of kidnapped IDF soldier Gilad Schalit—held by Hamas since June, 25, 2006. An associate of Yishai explained, “He thinks it is better to confront people with abhorrent views than to avoid them.” (According to a Hamas official in Syria, Hamas will discuss Schalit’s fate with Carter. Kuwaiti press, Al-Qabas, reported Schalit would not be returned alive if Israel fails to release 350 Palestinians it holds prisoner.) Israeli President Shimon Peres, Defense Minister Ehud Barak, and Yisreal Beiteinu leader Avigdor Lieberman also met with Carter. Lieberman planned to present diplomatic plans for exchanges of population and territory. Prime Minister Ehud Olmert and Foreign Minister Tzipi Livni declined participation for any such meeting. Several State Department officials, along with Secretary Condoleezza Rice, have offered criticism, “I find it hard to understand what is going to be gained by having discussion with Hamas about peace when Hamas is, in fact, the impediment to peace,” said Rice. Democratic Representatives Artur Davis of Alabama, Shelley Berkeley of Nevada, Adam Schiff of California and Adam Smith of Washington sent correspondence to Carter explaining that the meeting would confer legitimacy on a group that embraces violence. Despite the contention, Carter proceeded. “I feel at ease in doing this. I think there’s no doubt in anyone’s mind that, if Israel is ever going to find peace with justice concerning the relationship with their next-door neighbors, the Palestinians, that Hamas will have to be included in the process.” A February 2008 poll in the Israeli press, Haaretz, reported that 64 percent of Israelis favor direct talks with Hamas—former Minister of Internal Security Shlomo Ben-Ami and Israeli intelligence expert Efraim Halevy agree. 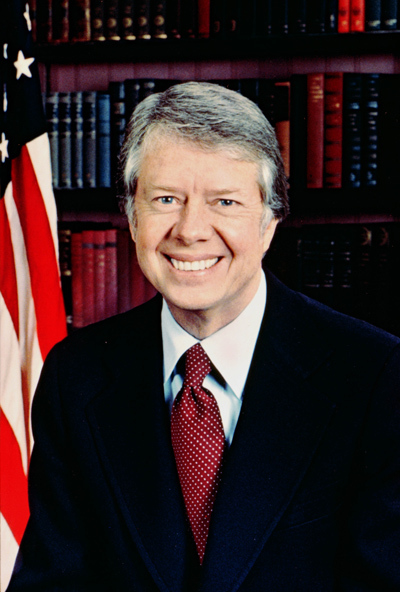 Jimmy Carter is recipient of the 2002 Nobel Peace Prize and brokered the Camp David peace accord with Egypt in 1978. He is also author of Palestine: Peace Not Apartheid, published in 2006.